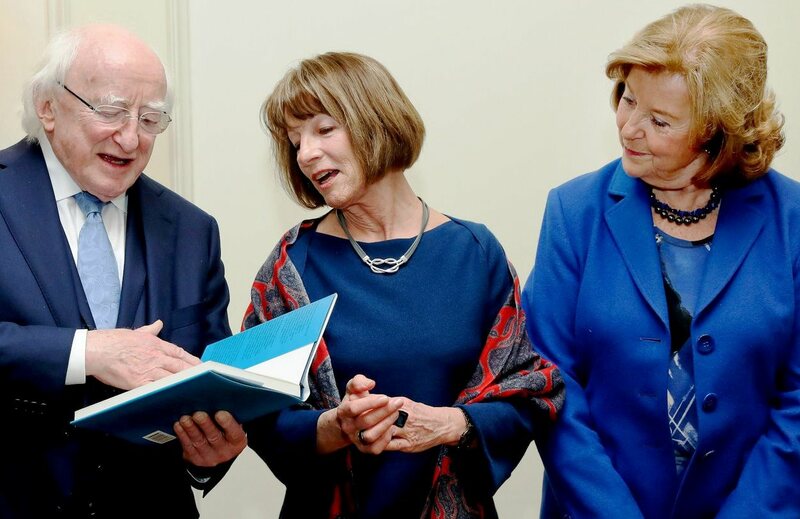 During his visit to Athens last month [February 2018], President Michael D Higgins was presented with a copy of The Lure of Greece, a collection of essays on the Irish involvement in Greek culture, literature, history and politics. This book, published over ten years ago in Dublin by Hinds in 2007, was edited by Professor John Victor Luce of Trinity College Dublin, Dr Christine Morris of TCD and Dr Christina Souyoudzoglou-Haywood of UCD. Many of the chapters in this book were first presented as papers at the first conference of the Irish Institute of Hellenic Studies in Athens in September 2003 in NUI Galway. The book was launched in the Classics Department in Trinity College Dublin on 23 May 2008. President Higgins was presented with a copy of The Lure of Greece by Dr Christina Souyoudzoglou-Haywood and the institute’s patron, Mrs Anna Mallikourtis. There was extra pleasure in seeing the presentation of this book because opening chapter is my paper on ‘Sir Richard Church and the Irish Philhellenes in the Greek War of Independence’ (pp 1-18). Many are familiar with the Philhellenes — those foreigners who devoted their lives to Greece at the beginning of the 19th century. But few are aware of the many Irishmen who fought in the Greek War of Independence or of their roles as Philhellenes. Reading many British historians (see Dakin 1955 and 1972, Woodhouse 1969 and St Clair 1972), it is easy to believe that all the Philhellenes were British romantics, the most noble and enthusiastic being Lord Byron. There may have been a smattering of Americans, but the French among them were portrayed as rogues and knaves, and other nationalities, particularly Russians, as susceptible. This typecasting was so Anglo-centric that both Byron and the eccentric Lord Cochrane are no longer Scots but honorary Englishmen. 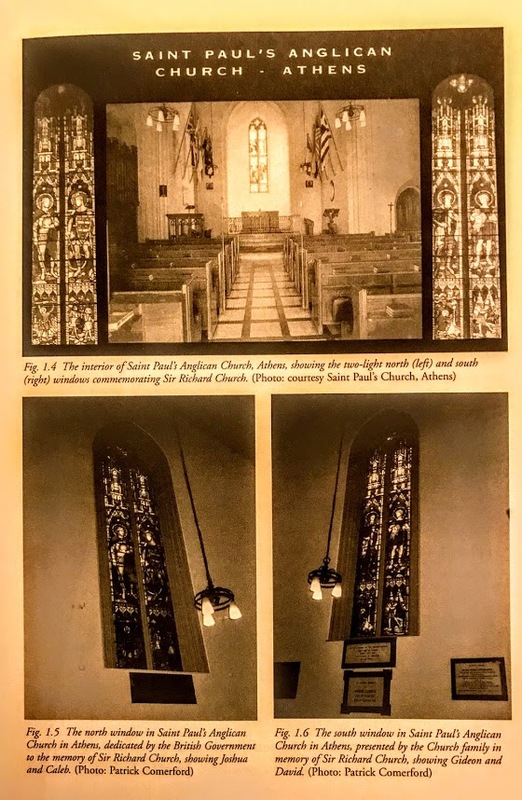 So too with the Irish Philhellenes, especially Sir Richard Church from Cork: a plaque in Saint Paul’s Anglican Church in Athens claims he won the affection of the people of Greece ‘for himself and for England’. Yet Church was the leading Irish Philhellene, and was once described as the ‘liege lord of all true Philhellenes’ (Woodhouse 1969, 157). And there were many more Irish heroes who filled those ranks. The Napoleonic wars in the early 19th century, and the capture of the Ionian Islands brought the first future Irish Philhellenes to Greece, including Sir Hudson Lowe, (1769–1844) from Galway. Lowe is often remembered as Napoleon’s jailer, but his campaign for the abolition of slavery is forgotten. He was second-in-command in the expedition to the Ionian Islands, was present at the capture of Kephalonia, Ithaki and Lefkhada, and he later framed a provisional administration for the islands. The Greek population appreciated him so much that they presented him with a sword of honour on his reluctant departure. Lowe was accompanied by Richard Church (1784–1873), who was born into a prominent Quaker merchant family in Cork. When he ran away to join the army he brought disgrace on his Quaker parents who were disowned or excommunicated for buying him a commission. As a 16-year-old ensign in 1800, he visited Greece for the first time and wrote home: ‘The Greeks, who are slaves to the Turks and are Christians, are ... a brave, honest, open generous people, continually making us presents of fruit’ (Ferriman 1917, 112; Woodhouse 1969, 20). After the British captured the Ionian Islands in 1809, Church quickly raised a Greek regiment of light infantry, and within six weeks had Greek troops involved in the fighting. He conducted the landing on Zakynthos, and went on to distinguish himself at the capture of Ithaki and Kythera. When he was posted to Zakynthos, Church began providing military training for the Greeks, including Theodoros Kolokotronis, who fought with distinction alongside Church and Lowe at Lefkhada and became a captain in the new regiment. When Church’s arm was shattered at the storming of the bastion, he went on sick leave, visiting Athens, travelling through northern Greece, and reporting to the British embassy at Constantinople. Back on Zakynthos, he recruited more Greeks, and soon reported that 6,000 to 8,000 Greeks could have been recruited, so overwhelming was the interest. One Greek leader promised that if Church could train his men they would win for him the fame of Miltiades, Leonidas and Themistocles. In 1812, Church went to London seeking permission to raise a second regiment. As he left he was presented with one memorial describing him as ‘illustrious chief’ and another asking for British assistance in liberating Greece. But, although Church was raised to the rank of lieutenant-colonel and was given sanction to raise a second regiment of Greeks, he did not win the political support he hoped for. On his way back to Zakynthos, he stayed in Vienna with Count Laval Nugent (1777–1862) from Co Wicklow, a field marshal in the Habsburg army and a life-long advocate of the cause of Greece. Church’s Greek troops captured Paxos and the town of Parga on the mainland. He later left Zakynthos for Naples, where he assisted in the negotiations for the surrender of Corfu. By then he was, in the words of St Clair, ‘more Greek than the Greeks’ (St Clair 1972, 320). He argued unsuccessfully behind the scenes at the Congress of Vienna for an independent, sovereign Greek state. Instead, he was ordered to disband his Greek regiments, the Ionian Islands became a British fiefdom, and in an act of treacherous betrayal, Parga was sold to Ali Pasha. Disappointed, Church left Greece for a military career that took him to Austria and Italy. Meanwhile, a new wave of Irish radicals became interested in Greece, including Edward Blaquière, (d. 1832), a romantic Dublin seaman of Huguenot descent, and Charles James Napier (1782–1853) from Celbridge, Co. Kildare, a first cousin of Lord Edward FitzGerald. Blaquière first came into contact with the Greek revolutionaries when he met John Louriotis, who was raising funds in Spain and Portugal. Blaquière’s suggestion that London was a better place for fundraising led to the formation of the London Greek Committee, marking a crucial stage in the Greek cause. Early Irish members of the committee included the poet Thomas Moore, and a future Governor of the Ionian Islands, Lord Nugent. Blaquière soon headed for Greece, stopping in Genoa to visit Byron, who was planning to travel to Latin America. Blaquière persuaded him to return to Greece, advising Byron to go first to Zakynthos. Instead, Byron sailed for Kephalonia, where the British governor or resident was Napier from Celbridge. Byron first stayed as a guest of Napier, who later found him a villa at Metaxata, south of Argostoli. There Byron wrote: ‘Colonel Napier and myself are as decided for the cause of Greece as any’ (Woodhouse 1969, 102). Among Byron’s friends at Metaxata was the regimental Irish doctor, Dr James Kennedy, who taught him demotic Greek, and the Philhellenes who visited Byron there included the Belfast journalist James Emerson (1804–1869). Napier, faced with continual opposition from British administrators in Corfu, was worried that Byron’s presence and his visitors threatened his own position. Byron left Kephalonia on 30 December 1823, and arrived at Missolonghi on 5 January 1824, hoping he would soon be joined by Napier as commander-in-chief of the Greek army. But Byron died there on Easter Sunday, 18 April 1824; the day before he had said: ‘I wish Napier and Hobhouse were here, we would soon settle this business.’ Three days after Byron’s death, Blaquière arrived back in Zakynthos with the first instalment of a British loan; within days, Byron’s coffin began its journey back to England on board the Florida, the ship that brought Blaquière back to Greece. Blaquière now tried to recruit either Church’s friend, Count Laval Nugent, or Napier, as commander of the army. Napier had first arrived in the Ionian Islands in 1819. On a confidential mission from Corfu to Ali Pasha, he was converted to the Greek cause, and when the war of independence began on 25 March 1821 he started supplying military intelligence to the Greeks and publishing pamphlets in English supporting the struggle. Despite his reputation as a radical and a Philhellene, Napier was appointed British resident of Kephalonia, where he was an ‘enlightened despot’, providing roads, bridges and public buildings, assisted by his Director of Public Works, John Pitt Kennedy (1796–1879), a Church of Ireland rector’s son from Carndonagh, Co Donegal. 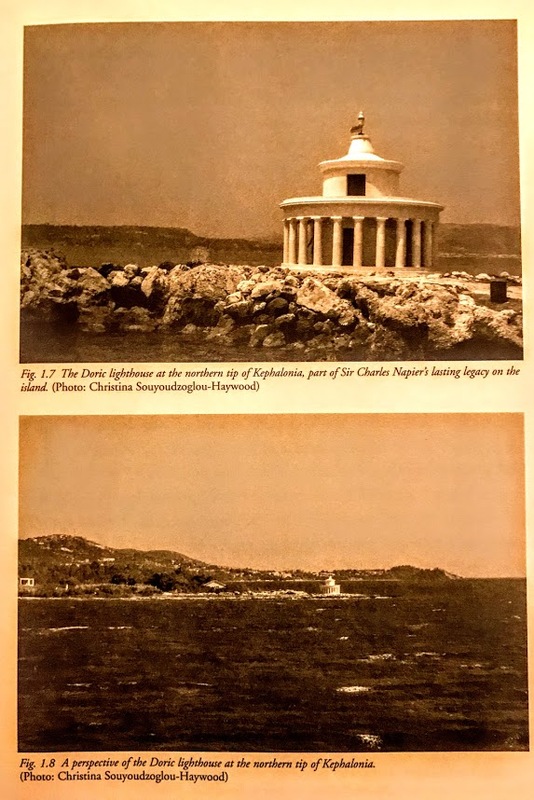 Napier and Kennedy erected the elegant, circular Doric lighthouse at Aghios Theodoros, along with market places, a marine parade, quays, courthouses, prisons, hospitals, and schools. They criss-crossed the once-impassable island with a network of roads and bridges, laid out broad streets and wide squares in Argostoli and Lixouri, and provided a tree-lined avenue to the Monastery of Aghios Gerassimos. Napier also broke the feudal privileges of the island aristocracy, putting agriculture on a firm footing. John Augustus Toole (ca. 1792–1829), who came to Kephalonia as a member of Napier’s staff, worked closely with Kennedy on building the roads and bridges. By the winter of 1826 and 1827, he was among the supporters of Kapodistrias who organised their activities from Corfu under the cover of a charitable committee. Napier’s time in Kephalonia ‘was probably the happiest in his life’ (DNB xiv, 46): there he fell in love with a Greek woman, Anastasia, who became the mother of his two daughters. Long after Byron’s death, Napier continued to hope he would become the Greek commander-in-chief, hopes harboured too by his friends among the Greek leadership, including Kapodistrias and Mavrokordatos. But the appointment never came and Blaquière and Kolokotronis, who turned first to Laval Nugent, then offered the command to Church. Napier eventually left Kephalonia, leaving his Greek-born daughters behind. He returned occasionally to Ireland, visiting his friend Kennedy at Glasnevin, but eventually made his name as the Conqueror of Sind in India. When the War of Independence broke out in 1821, Church expressed the hope that he might become involved once again in the Greek cause. 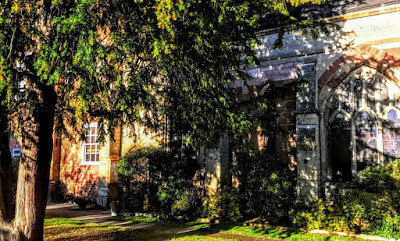 Blaquière worked hard politically to have Church invited back to Greece to lead the armed forces, but while he waited on Zakynthos for Church’s return, his hopes appeared to be in vain. Two weeks after Church’s marriage to Elizabeth Augusta Wilmot, sister-in-law of the Earl of Kenmare and distantly related by marriage to Byron, and two weeks after the fall of Athens to the Turks, the Greek government finally invited Church to assume command. ‘What are you doing? Where are you to be found? My soul has never been absent from you – We your old comrades in arms ... are fighting for our country – Greece so dear to you! – that we may obtain our rights as men and as people and our liberty – How has your soul been able to allow you to remain away from us, and to withhold you from combating with us? I expected you here before other Philhellenes ... Come! Come! and take arms for Greece: or assist her with your talents, your virtues, and your abilities, that you may claim her eternal gratitude ...’ (Dakin 1955, 137, 141–2; St Clair 1972, 321). However, when he heard of rifts within the Greek government, Church abandoned his plans to sail to the Ionian Islands and returned to England in the hope of making a personal plea to Canning on behalf of Greece. Blaquière waited on Zakynthos expecting Church’s arrival; eventually invitations were issued to Kapodistrias to become President, to Church to command the army, and to Cochrane to command the navy. And so, less than three years after Byron’s death, on 9 March 1827, Church landed in the eastern Peloponnese. The next morning, he and Kolokotronis embraced under the very colours the Irishman had given his friend in the Ionian Islands twelve years earlier and Church received a hero’s welcome from his former comrades in the Ionian regiments as Kolokotronis told them: ‘Our father is at last come! We have only to obey him and our liberty is assured!’ (Dakin 1955, 141–3; Dakin 1972, 56; Woodhouse 1969, 121, 137; St Clair 1972, 325). Church took with him an Irish aide-de-camp, Captain Charles O’Fallon, and a second Irish sea captain, Francis Castle. Later in the day, Church and Kolokotronis, along with Blaquière and other leading figures in the struggle, dined on board the Cambrian with the frigate’s commander, Commodore Gawin William Rowan Hamilton (1784–1834). Hamilton had been stationed in Greek waters for seven years, using his position to support the Greek cause; he was the son of the United Irish leader, Archibald Hamilton Rowan (1751–1834), and son-in-law of Sir George Cockburn (1763–1847) of Shanganagh Castle (see Astbury 1996). Cochrane, who had sailed from Bantry Bay with his Irish secretary, William Bennet Stevenson, arrived in the Aegean a week after Church, on Saint Patrick’s Day 1827, on the French brig Saveur, captained by an Irish naval officer, George Thomas. At Aegina, Church and Cochrane refused to accept their appointments while the Greek factions continued to squabble, and Church’s patient mediation was chiefly responsible for the reconciliation of the rival factions. When Church and Blaquière threw in their lot behind the election of Kapodistrias, Church’s voice proved to be the deciding factor, and on Easter Sunday, 15 April 1827, Church took his oath of office. One of Church’s first actions was a disastrous attempt to drive off the Turkish force besieging the tiny Greek garrison in the Acropolis in Athens. As Cochrane vacillated, the Greek force of 10,000 was thrown into disarray, and in a Turkish onslaught the Greeks were cut to pieces. Church, O’Fallon and the men closest to them scrambled on to one of the small boats offshore, but 700 others were killed, including 22 Philhellenes. One of the first to rush to Church’s defence was his friend Blaquière. Stern in the face of his critics, Church then rallied his forces at Aegina and crossed the Gulf of Corinth to establish new headquarters at Akrocorinth and to plan a campaign across the northern Peloponnese to stir a fresh rebellion. Once again, Cochrane’s actions threatened Church’s plans, but Church carried on hoping to extend the war into Albania in the hope of encouraging a revolt there too. A major turning point in the War of Independence came at the Battle of Navarino. Thanks largely to the actions of Hamilton and Church, a large Turkish naval force was confined to the Bay of Navarino for a month; then, in a four-hour battle on the morning of 20 October 1827, the allies annihilated the Turkish-Egyptian fleet in the last sea battle of the age of sail. The naval power of Turkey was broken and Greek independence was imminent. Church rejoiced at what he called ‘this signal interposition of divine Providence’, and in a letter to all Greek commanders spoke of his ‘extreme delight of hearing the thunder of the battle’ (Woodhouse 1969, 140–1). Soon after Navarino, Hamilton was court-martialled after scuttling the Cambrian off the coast of Crete – he had been suspected of waging his own wars against the Turkish fleet against British orders from Constantinople, but was honourably acquitted and returned to Ireland. After Navarino, Church believed the allies would impose a settlement on the Turks. But his hopes were dashed, and he set out once again when he received $100,000 and new supplies from the Greek government. Kapodistrias arrived in Greece as President on 18 January 1828, and for six months delayed Church’s plans as he promised but failed to deliver more troops and a flotilla. Church was left waiting and then faced open mutiny among his men, who blamed him for the effect of the capricious orders from Kapodistrias. Church found it increasingly difficult to work with the President, who suggested that if Church disliked the new regime he was free to resign. But Church soldiered on with a successful guerrilla campaign in the area of the Gulf of Arta, and had Kapodistrias afforded him even moderate support the Irish general could easily have captured Thessaly and much of Epiros. However, Kapodistrias promoted his brother Agostino over both Church and Ypsilantis and jeopardised Church’s victory at Vonitsa. To add insult to injury, the President sent his tiresome brother at the head of an army that had never fired a shot in western Greece to receive the surrender of cities that should have fallen to Church. When Church arrived in Missolonghi on 19 May 1829, he found the garrison had capitulated the previous day to Agostino. But he was still anxious to see the house where Byron had died, and when he entered the city on 20 May the troops gave him a loud, spontaneous welcome. Finally, on the island of Aegina in June, Church informed Kapodistrias he could no longer serve under the existing government. He had received what Dakin describes as ‘an uncommonly bad deal’ and left Greece within days (Dakin 1955, 181–4; Dakin 1972, 60). Church’s campaign in western Greece established the Greek claim to a frontier in the strategic area of the Gulf of Makrinoros. However, he was angry when he heard Kapodistrias was willing to accept proposals that would confine the new Greek state to the Morea and exclude both the western provinces, which he had helped liberate, and the islands of Crete and Samos. He returned to the fray, and in February 1830, in a hastily-drafted pamphlet, he claimed that to re-impose the Turkish yoke on a people recently liberated was a crime against a nation and a crime against humanity. His brother-in-law, Sir Robert Wilmot-Horton (1784–1841), presented a draft of the pamphlet to Prince Leopold of Saxe-Coburg, who was hoping to become King of Greece; within two days, Leopold formally withdrew his name, stating his case in words that paraphrased Church’s pamphlet. Leopold later became King of Belgium; Church for his part returned to Greece permanently to resume an active military and political career. In 1833, Otho of Bavaria arrived as the new Greek monarch. A year later, when Athens replaced Nafplion as the capital, only seven of the many Philhellenes who had once fought for Greece remained in the new state, and of these seven, two were Irish: FitzGibbon and Church. Rowan Hamilton died that year at Killyleagh Castle, Co. Down, Napier was in Normandy, writing poetry and historical novels, and Blaquière drowned the previous year in a leaky ship fighting for the liberal cause in Portugal. Church had become a Greek citizen, and in 1834 he and his wife moved into No 5 Odos Scholeiou, a house belonging to the Scottish historian, George Finlay, off Adrianou in the Plaka and beneath the Acropolis (Figs. 1.1 & 1.2). There were rumours that Church would be given the command of the army once again; but, while this never materialised, the new king restored Church to the rank of general. Church was also made a councillor of state, military governor of Roumeli, and, in 1836, became Inspector-General of the army. Otho proved to be a despot, and Church played a conspicuous role in the >coup d’état of September 1843. A paper bearing demands for reform was carried to the palace by Church and two other rebel leaders, giving the king a choice of conceding reforms or abdicating – but for Church’s role, Otho would have been given no choice at all. Otho survived and later took his revenge on Church, dismissing him as Inspector-General. However, the Greek press went out of its way to apologise to Church for the treatment he received. But Church remained a senator for life and a Greek citizen, and on the outbreak of the Crimean war Otho recalled him as a general, a rank conferred on no other foreigner. A popular revolt in 1862 finally forced Otho to leave Greece. ‘I do not regret having sacrificed everything to the cause I embraced ... Notwithstanding what has happened, were it to be done again, I should voluntarily undertake the same difficulties and dangers, and even with anticipation of ruin to my domestic fortunes’ (Dakin 1955, 219–20; Woodhouse 1969, 159; Dakin 1972, 159). Church died in his ninetieth year on 27 March 1873. He was honoured with a public funeral and was buried in the First Cemetery of Athens (Fig. 1.3), close to Kolokotronis and the heroes of the War of Independence. Ioannis Gennadios, in his funeral oration, described him as ‘the truest Hellene, the most steadfast and most affectionate of the sons of Greece.’ (Dakin 1955, 220). Even Finlay was moved to make amends for an earlier breach in their friendship, declaring: ‘There could not be a nobler heart, and I think he was a perfect model of what he considered a perfect knight’ (Dakin 1955, 219–20; Woodhouse 1969, 159). There were other distinguished Irish Philhellenes. Prominent among them were the brothers-in-law, James Emerson, later James Emerson Tennent (1804–1869), and Robert James Tennent (1803–1880), who doubled as war correspondents for the London press newspapers as they fought for Greece. Apart from Hamilton and Blaquière, other Irish naval officers fought in the War of Independence: George Thomas fitted out the French brig Saveur (or Soter) for Cochrane and later sank seven Turkish vessels in the Gulf of Patras; Charles O’Fallon was Church’s aide-de-camp; Francis Castle joined the Greek cause long before Church or Cochrane; Francis Kirkpatrick followed Church to Greece in 1827; and Gibbon FitzGibbon (1802–1837), the son of a prominent Dublin Catholic lawyer, served in the Greek navy until his death in 1837. And there were key administrators from Ireland on the Ionian Islands with openly Philhellenic sympathies, including Lord Nugent from Westmeath, Viscount Kirkwall from Co. Tipperary, Sir John Young from Co. Cavan, and a countess who found her way from Tipperary to Zakynthos. The Irish general and poet, Lord Nugent, a Philhellene and early member of the London Greek Committee, was among the British governors of the Ionian Islands. As Lord High Commissioner from 1832 to 1835, Nugent entertained a visiting King Otho in the Solomos villa in Zakynthos, and it may have been there that Nugent introduced Eliza-Dorothea Tuite, from Nenagh, Co. Tipperary, to Count Giovanni Salomos or Solomos of Zakynthos. They were married in 1838, giving the Irish Philhellenes an interesting family connection with Dionysios Solomos, author of Hymn to Liberty, the Greek national anthem. Sir George FitzMaurice (1827–1889), known for much of his career as Viscount Kirkwall and later sixth Earl of Orkney, was one of the important Irish figures in Greece immediately after independence. He spent four years as a civil servant in the Ionian Islands in the 1850s, and left an extensive account of life on the islands before reunion with Greece. Sir John Young (1807–1876), from Bailieborough, Co. Cavan, who came to the Ionian Islands in 1855, was a benign if bumbling reformer. In 1857, he freed prominent patriots, radicals and journalists from Kephalonia who had been jailed or exiled. However, in a dispatch to the British colonial secretary, Young recommended that Corfu and Paxos should be converted into full British colonies. When the dispatch was leaked, Young’s position became untenable and he was replaced by Gladstone. However, Young’s intemperate proposals hastened the inevitable, and the Ionian Islands were united to Greece in 1864, realising the hopes Church and Napier once cherished for Zakynthos and Kephalonia. Sir Thomas Wyse (1791–1862) from Waterford played a key role in the decades immediately after Greek independence. He first visited Athens, the Greek islands and Constantinople in 1818. After an unhappy marriage to Napoleon’s niece and some time as MP for Tipperary and Waterford, he returned to Athens in 1849 as the British minister or ambassador. He became embroiled in the Don Pacifico affair in 1850, and in engineering a joint occupation of Piraeus by Britain and France during the Crimean war. But he devoted the rest of his life to helping Greek artistic, literary and educational 12 projects, and was given a state funeral in Athens in 1862. This would-be King of Greece was Wyse’s Waterford-born son, William Charles Bonaparte Wyse (1826–1892). Unlike Byron, few of the Irish Philhellenes were romantics: their motivations were more political, and sometimes even religious. Some had close ties to the Radical United Irishmen of the 1798 Rising, including Hamilton, who was the son of Archibald Hamilton Rowan. Napier, a first cousin of Lord Edward FitzGerald, once wrote: ‘The Greeks are more like the Irish than any other people, so like, even to the oppression they suffer, that as I could not do good to Ireland the next pleasure was to serve men groaning under similar tyranny’ (Lawrence 1952, 65). He maintained a lifelong, tender friendship with FitzGerald’s daughter, Pamela, one of the last people to visit him on his deathbed. James Emerson, later Sir James Emerson Tennent, and Robert James Tennent were related to two of the leading Belfast United Irishmen, William Tennent, and Henry Joy McCracken. Church, Napier, and many of the Irish Philhellenes, were Radical Whigs rather than Irish nationalists. In 1825, while Napier was in London, Lowe tried to visit him, but Napier refused the call, explaining: ‘It is not my intention to conspire with gaolers’ (Ferriman 1917, 27). Other Radical Whigs included Lord Nugent, an advocate of Catholic Emancipation and the abolition of slavery and capital punishment. Blaquière, Church and others were also moved by their deep Christian faith. Church, who often travelled with nothing more than his Bible and his sword, believed the Greek struggle was a holy war and he saw himself as a crusader. These Irish Philhellenes also shared a simple and genuine love of Greece. Church wrote to his sister: ‘The Greeks, who are slaves to the Turks and are Christians, are as opposite a people as possible – a brave, honest, open generous people’ (Ferriman 1917, 112; Woodhouse 1969, 20). ‘The merry Greeks ... are worth all other nations put together. I like to hear them; I like their fun, their good humour, their Paddy ways, for they are very like Irishmen. All their bad habits are Venetian; their wit, their eloquence, their good nature their own’ (Lawrence 1952, 62). He also once declared: ‘I am a Greek down to the nails of toes and the marrow of my bones’ (Fortou 2000, 66–9). Blaquière is castigated by St Clair as a ‘naive and superficial busybody’ and ‘a liar and a trickster’ who never understood the underlying causes of the Greek struggle (St Clair 1972, 144, 146, 208). But no-one can question his genuine love of Greece; for him, the cause of Greece was ‘by far the most glorious that ever graced the page of history [and] should not be sacrificed at the unhallowed shrine of avarice, envy or gratitude’ (Blaquière 1825, xiv). Greece was, in Biblical terms, a land flowing with milk and honey, and Crete was ‘the most prolific and beautiful spot on earth’ (Blaquière 1824, 301–2). Unlike Byron and Cochrane, the memory of Church and Ireland’s other Philhellenes has been sadly neglected in the land of their birth: there are statues to Napier in Trafalgar Square and Saint Paul’s Cathedral, London, but apart from the full-length portrait of James Emerson Tennent, in Belfast City Hall, the Irish Philhellenes are without any public monuments at home. Church’s papers remain in the British Museum largely unpublished, and he has never been the subject of a major study or biography. 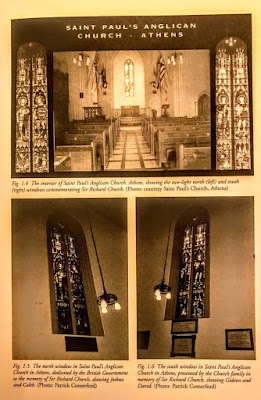 The south windows, presented in 1875 by the Church family, show Gideon who refused the crown after liberating the Israelites from the Midianites, and David holding the severed head of Goliath. Below Gideon is a representation of the story of the dew and the fleece (Judges 6: 38), a reference to Church’s demands that Greece should have the most extensive borders possible; below David is a representation of him slaying Goliath, an allusion to the fact that Church was small in stature but defeated the Ottoman might. His once-charming house in the Plaka was long abandoned and covered in graffiti. Tzortz Street, close to Omonia and the Polytechnic in Athens, was named after him, using a transliteration of his name as he spelt it in Greek. The spelling Tzortz remains on the nameplates in Greek at each end of the street, but on most pillars and maps Tzortz is badly transliterated from Greek into English as ‘George’ rather than ‘Church’. 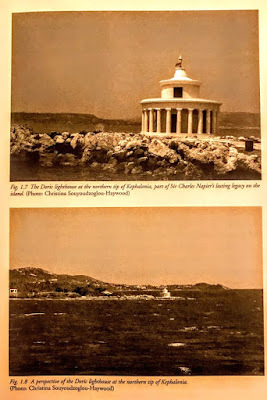 The lasting memorials to Napier and Kennedy are their roads and bridges in Kephalonia, and the lighthouse at Aghios Theodoros (Figs. 1.7 & 1.8). 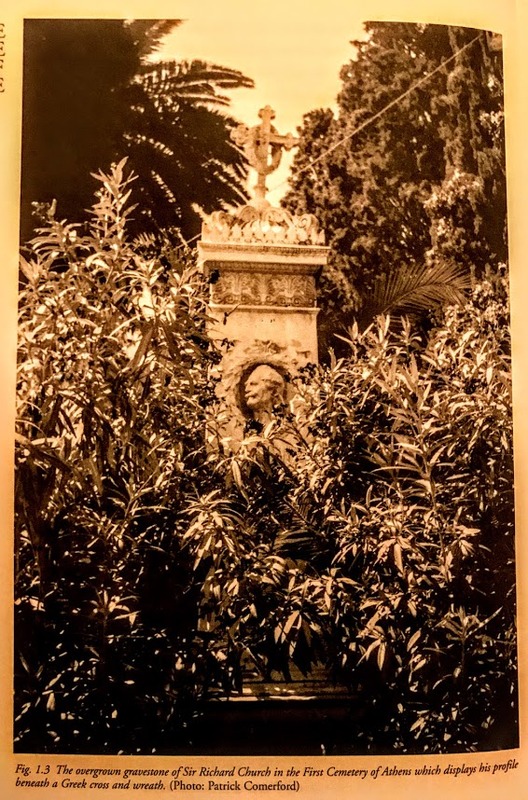 Napier’s Gardens were 16 given to Argostoli by his Greek-born daughter in 1906. 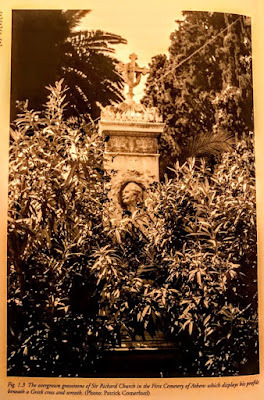 In recent years, the gardens have been restored by the Argostoli Demos, and furnished with an old restored bust of Napier. Perhaps the lasting monument to these Irish Philhellenes is that Greece is free; but they deserve more generous public acknowledgments of their contributions to the liberty we enjoy in the two countries I call my own. Astbury R (1996), ‘Sir George Cockburn: An Irish traveller and collector’, Classics Ireland 3, 1–17. Blaquière E (1824), The Greek Revolution, its origins and program, London. Blaquière E (1825), Narrative of a second visit to Greece, London. Dakin D (1955), British and American Philhellenes during the Greek War of Independence, 1821–1833, Thessaloniki. Dakin D (1972), The Unification of Greece 1770–1923, E. Benn, London. DNB: Dictionary of National Biography. Ferriman ZD (1917), Some English Philhellenes, Anglo-Hellenic League, London. Fortou O (2000), ‘I am a Greek down to the nails of toes and the marrow of my bones’, 66–9 in Odyssey: Kephalonia-Ithaka, Argostoli. Lawrence RN (1952), Charles Napier, Friend and Fighter, 1782–1853, Murray, London. St Clair W (1972), That Greece might still be free: the Philhellenes in the War of Independence, Oxford and London. Woodhouse CM (1969), The Philhellenes, Hodder & Stoughton, London.